Last night I watched Anthony Bourdain’s ‘No Reservations’ exploration of the SXSW Festival in Austin, TX, a rerun of a great episode I had somehow missed. SXSW (as in ‘South By Southwest’) is a film and music festival/conference that settles on the city like an electrified storm cloud each year in mid-March. It began in 1987, and it’s been growing ever since. That is not what I mean to write about here, though. Because SXSW is a thing for another generation. I’m sorry about this. It looks like a lot of fun. I would have no objection to giving it a once-over in person, but there doesn’t really seem to be a place for someone my age there. Even Bourdain — the epitome of coolly cynical and dissolute living, the expert on naughty pleasure, all close-cropped gray hair and rangy frame, his blood-shot eyes inscrutable behind Ray Ban aviators — Bourdain himself noted that he felt like someone’s perverted uncle as he followed all that exuberant, writhing, partying youth around with his camera crew. 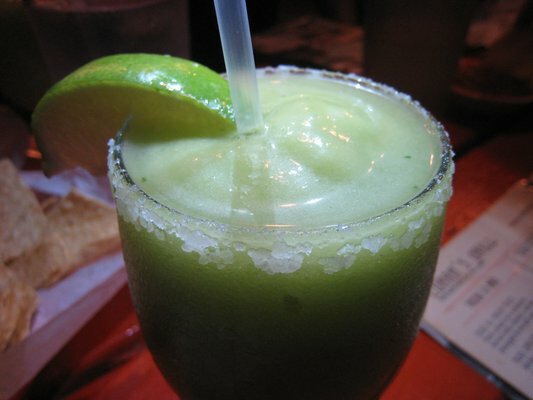 My point here is this: Somewhere in the tangle of roasted pigs, tacos, blues, grunge, tattoos, etc., the subject of Avocado Margaritas came up. A throaty-voiced, dark-haired, laughing siren named Sleigh Bells brought it up, actually. I watched her mix half a blender’s worth of tequila, some other stuff, and the innards of about three avocados into a green, frothy, salt-rimmed glass of brilliance. When Bourdain said: “This should not have worked, but it did”, I admit I was hooked. Now I must see this thing through to its conclusion. There was no recipe offered on the show. Everyone was lurching around too much. So I’ve done some research, some soul-searching, some recipe-searching, some blending on my own. Here is what I have come up with so far. I don’t drink blended margaritas generally, but in this case, we must make an exception. Thank me or curse me, and proceed at your peril. 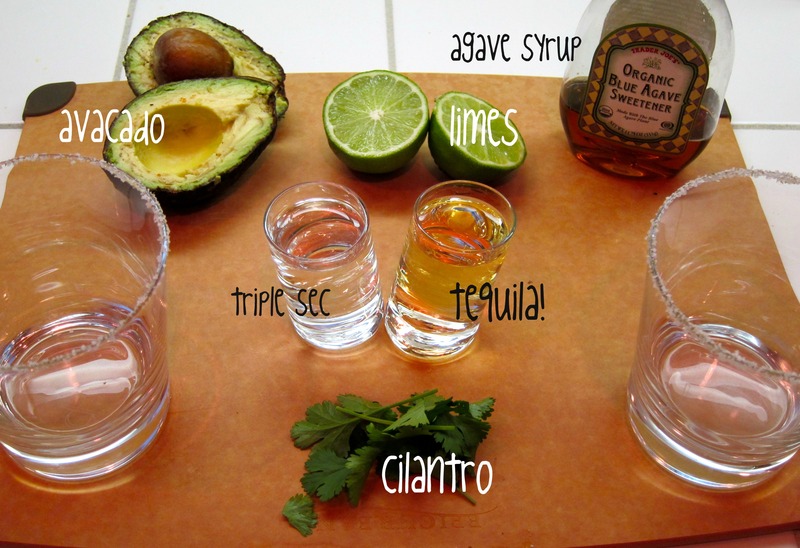 Place ice, tequila, avocado, triple sec, lime juice, and cilantro in a blender, and blend until desirably smooth. Add agave syrup, a dash at a time, if additional sweetness is needed. Salt your glasses if you wish. Close your eyes, take a sip, think of it as a healthy smoothie. I am still trying to figure out how to incorporate jalapeno peppers. Because that warmth in the mouth is the only thing missing. Here are my thoughts: If you have a week ahead of time, infuse your tequila with a jalapeno pepper. Then proceed as above. If you don’t have a week, rub the rim of the glass with a cut jalapeno, getting the oil from the seeds and the pepper. Discard any seeds or membrane in or on the glass. Dip rim quickly in lime juice, then salt with a little lime zest mixed in for color. Proceed as above. 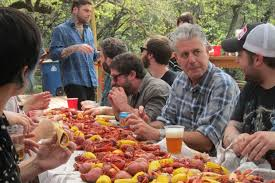 Below is a picuture of Bourdain after his Avocado Margarita, which was followed by a whole roasted pig and then this massive crawfish boil. Apparently, this is how musicians eat now. This is obviously an enlightened man, to whom good and bountiful things happen. A man completely without regret. Timely, happy Cinqo de Mayo! What a brutal day June 8 was for those of us who love him.